Folktales and fables from around the world have striking similarities in that they convey universal truth and wisdom, typically via animal protagonists, generously laced with humor. And yet, they differ in the presentation, drawing from cultural traditions of the people orally handing down these tales. 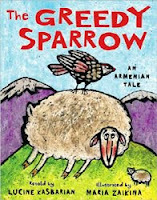 One of the Armenian folktales passed down through generations in the author's family orally is The Greedy Sparrow. The book dedication reads, To my forbears, great-grandmother, and father, all of whom preserved the sparrow fable through the ages. The great-grandmother mentioned is a celebrated storyteller from the Old Country. I was delighted to get in touch with author/journalist Lucine Kasbarian a few weeks ago. As her website notes, the author is passionate about her ethnic Armenian heritage and enthusiastically shares it with the world. The Greedy Sparrow is the first time English retelling of this tale in the children's picture book format. It starts with Once there was and was not a sparrow, which suggests that the tale may be real or imagined, we may never know. A sparrow gets a thorn in his foot. He flies around and finds a kindly baker who removes the thorn and tosses it into her oven. The wily sparrow, instead of thanking her and moving on, comes back a while later and demands that he get his thorn back. Needless to say, the baker cannot give it back. Either you give me my thorn or you give me some bread demands the sparrow. And the baker has no choice but to give some bread. The sparrow is not content. He goes about tricking and bartering item after item, including a new bride in the bargain, until he meets a minstrel with a lute. When the confounded minstrel has no choice but to hand over his lute, the sparrow seems contented. He starts singing the story, In place of a thorn, I got a bread. In place of a bread, I got a sheep... and so on till, ...I got a lute. And now I am a minstrel! In all the gloating, he loses footing and ends up with a broken lute and a thorn in his foot. Back at Square One. Trickery is not rewarded, especially when it takes advantage of the good nature of people who willingly help others. That message got cleverly (and clearly) conveyed to my six year old who pored over the illustrations with fascination, while reading the simple narration. She particularly like the speech bubbles, with red text reserved for the sparrow, which automatically made her change her voice and accent as she read aloud the sparrow's part in the narration. The bold, vibrant folk-style illustrations complemented the story well, transporting us to a time and place that evokes nothing but simple unadulterated joy, and possibly nostalgia for a bygone era. Ms.Zaikina's illustrations reminded me of my childhood favorite Ladushki, Ladushki - Russian Folk Rhymes and Tales For Little Ones illustrated by Yuri Vasnetsov and retold in English by Irina Zheleznova, a book vibrant with color and imagination, which to this day stirs warm memories when I share it with my children. References to places in Armenia, the map and activities on author's website and the traditional attire shown in the illustrations gave us a jump start to explore the geography and culture further. 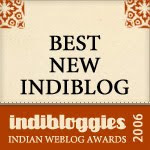 Here is an interview with the author, conducted by Tom Vartabedian, at Asbarez.com. A very close linguist friend is dooing her post-doctorate in Armenian. She is buliding up a lexicon for the language which she says is dying out. She would LOVE this. Passing on the link - thanks on her behalf! A great lesson to teach children - "Trickery is not rewarded, especially when it takes advantage of the good nature of people who willingly help others." Great review as always Sheela. Wow, Sheela! Third review by you read in a row. It is pretty overwhelming. You have brought the book alive to us so beautifully. And I love folktales. They somehow seem to bring the smell of the earth to us. I read this book to my toddler and she loved it - especially the folk costumes! I'm going to suggest it to our library for the One World, Many Stories reading program this summer. Thanks for the review, Sheela! I interviewed the author of The Greedy Sparrow on Imagination Soup and she mentioned you as a favorite resource.